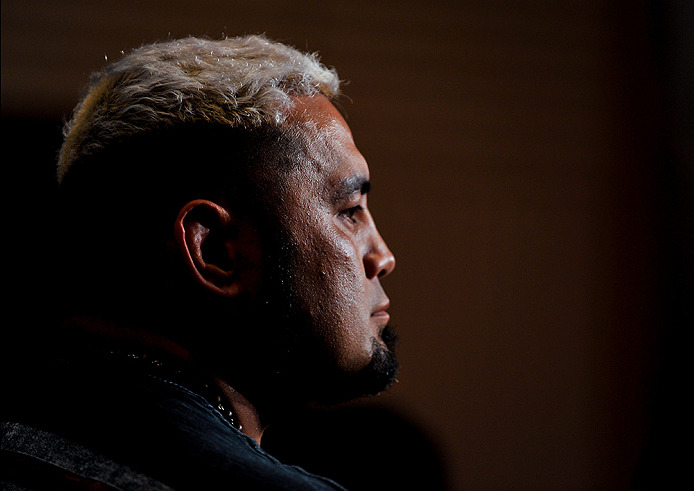 What a wild ride it has been for Mark Hunt – and that’s just in regards to his UFC career. By now, as the former K-1 world champion and PRIDE favorite readies to make his 17th appearance in the Octagon this weekend in Moscow, Russia, where he takes on Aleksei Oleinik, everyone who follows the sport knows Hunt’s story. The veteran powerhouse’s contract was acquired by the UFC when it purchased the famed Japanese promotion, but with Hunt in the midst of a five-fight losing streak, the organization was willing to buy out the rest of his deal and part ways. But Hunt pushed for an opportunity to compete and made his Octagon debut at UFC 119 in Indianapolis, losing to journeyman Sean McCorkle by straight armbar just 63 seconds into the first round. Given a chance to compete on home soil when the company returned to Sydney, Australia for UFC 127, Hunt collected a walk-off victory over Chris Tuchcherer. Seven months later, he defeated Ben Rothwell. Then he knocked out Cheick Kongo and Stefan Struve to extend his winning streak to four and establish himself as a contender in the UFC heavyweight division. He’s been a fixture in the Top 10 ever since, earning victories over contenders old and new and one former champion while sharing the cage with the biggest names in the division and fighting for the interim heavyweight title at UFC 180. “I’ve done my journey and I’m in the downhill stretch of things now,” said Hunt, just a few days prior to stepping in with Oleinik in the main event of the UFC’s first fight card in Russia, reflecting on his lengthy career in combat sports. “I’ve had a long career. I’ve been in the Top 10 in the UFC for a long time now and I’m enjoying my career. At 44 years old, Hunt is indeed the oldest fighter on the UFC roster, and with a win over the 41-year-old Oleinik this weekend, he will go down as one of the oldest fighters to ever earn a victory inside the Octagon. Currently, Randy Couture holds that record, having defeated James Toney by arm-triangle choke at UFC 118 in Boston at age 47. While he’s still very much a threat every time he steps into the Octagon and continues to work towards fighting for the UFC heavyweight title, Hunt has also taken on a mentorship role in recent years, imparting the lessons he’s learned and the experience he’s garnered on the next generation of Australian fighters, including a pair of top-ranked talents who will be in his corner on Saturday night in Moscow, heavyweight Tai Tuivasa and light heavyweight Tyson Pedro. Mentorship has always been a tricky thing in sports, as not every veteran is eager to take younger athletes under their wing and help guide them towards success for various reasons. Some are simply too focused on their own careers and don’t want to be teachers, while others have little interest in grooming the competitors who will eventually replace them on the roster. But some are quick to help and for Hunt, working with Tuivasa was an easy decision. “The younger generation is coming through and I’m the old guy,” began Hunt, who has logged 70 professional fights between mixed martial arts and kickboxing over his nearly 20-year career. “I’m the oldest fighter in the organization and if they look at me as a mentor, of course (I’m going to help). “Evolution says you have to – well, you don’t have to, but I like to help others coming through because it makes you a better person. But more than anything, Hunt likes to compete, and despite his standing as the most senior member of the UFC roster, the popular knockout artist has continued to push for opportunities to test himself against the best fighters in the division and dutifully accepted whatever matchups have been placed before him. After losing to former title challenger Alistair Overeem, he welcomed surging American contender Derrick Lewis to New Zealand and halted the Houston native’s six-fight winning streak with a fourth-round stoppage victory, a setback that remains Lewis’ lone loss in his last nine outings. Back in the win column, he lobbied for a date with someone ahead of him in the rankings, but was instead matched up with another rising star, Elevation Fight Team member Curtis Blaydes, who sent Hunt right back into the loss column with a dominant decision win at UFC 221 in February. Now he squares off with Oleinik, who has gone 5-2 in the UFC and introduced fans to a new array of submissions during his UFC tenure, including his signature hold, the Ezekiel choke, which he has successfully used to earn victories over Viktor Pesta and Junior Albini, the first two times the unorthodox choke has been completed inside the Octagon. Having just suffered a loss against a fighter who successfully took him to the canvas and kept him there and now facing an opponent who isn’t opposed to pulling guard in order to bring the fight to the floor, many have wondered how this weekend’s main event clash of styles will play out in Moscow. As far as Hunt is concerned, it’s no different than any other fight and he’s looking forward to seeing how things shake out on Saturday at the Olympic Stadium. “Every fight comes down to whether they can put their game on or whether you can; it just depends on how it goes on the night,” said Hunt. “I’ve prepared well for Aleksei. I’ve met him a couple of times today – he’s a nice person – but in the end, business is business and that’s how it will go down on the weekend.